The 2005–06 Cypriot First Division was the 67th season of the Cypriot top-level football league. Apollon won their 3rd title. Fourteen teams participated in the 2005–06 Cypriot First Division. All teams played against each other twice, once at their home and once away. The team with the most points at the end of the season crowned champions. 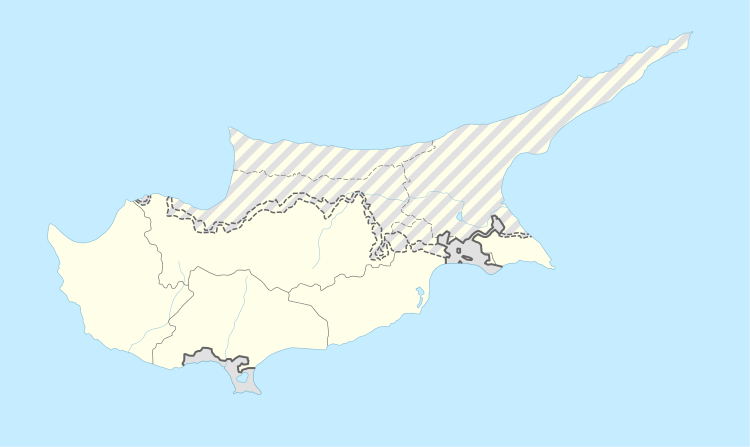 The last three teams were relegated to the 2006–07 Cypriot Second Division. The champions ensured their participation in the 2006–07 UEFA Champions League and the runners-up in the 2006–07 UEFA Cup. The teams had to declare their interest to participate in the 2006 UEFA Intertoto Cup before the end of the championship. At the end of the championship, the higher placed team among the interested ones participated in the Intertoto Cup (if they had not secured their participation in any other UEFA competition). AEP Paphos, Alki Larnaca and Aris Limassol were relegated from previous season and played in the 2005–06 Cypriot Second Division. They were replaced by the first three teams of the 2004–05 Cypriot Second Division, APOP Kinyras, APEP and THOI Lakatamia. 1 Apollon Limassol 26 19 7 0 68 24 44 64 Champions-UEFA Champions League 1st qualifying round. 2 Omonia 26 20 3 3 59 20 39 63 2006–07 UEFA Cup 1st qualifying round. 3 APOEL 26 19 5 2 63 22 41 62 Cypriot Cup Winner-2006–07 UEFA Cup 1st qualifying round. 9 Ethnikos Achna 26 8 4 14 42 43 -1 28 2006 UEFA Intertoto Cup 1st round. 12 APOP Kinyras 26 5 3 18 35 65 -30 18 Relegated to 2006–07 Cypriot Second Division. ↑ "Cyprus - List of Topscorers". Rec.Sport.Soccer Statistics Foundation. 2015-06-25. Archived from the original on 2015-08-18. Retrieved 2015-08-05. "2005/06 Cypriot First Division". Rec.Sport.Soccer Statistics Foundation. 2016-01-14. Retrieved 2016-01-14.